We wanted to give you a heads up that American Express is now offering a $10.00 Account credit* to individuals who open a new Serve account, file tax returns, and direct deposit to the refund (full disclosure, American Express is an Advertiser on Let’s Do Taxes). Click Register Now to open a new Serve Account. Direct Deposit your federal tax refund into your new account by May 31, 2015. Your new Serve account comes with the American Express level of protection. The prepaid funds are insured in case of a card loss or theft. And in case you have more questions about any aspect of Serve, there is a round the clock customer service to your disposal. Enjoy American Express service and security 24/7. Add cash for free across 27,500 CVS/pharmacy®, Family Dollar®, Walmart®, and participating 7-ELEVEN® locations. For more details on costs and benefits of American Express Serve Card, click here. How much does it cost to operate a Serve account? Below is a snapshot of fees related to operating a Serve account. You be the judge. 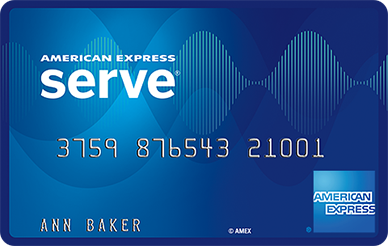 If you’re thinking about signing up for an American Express Serve card and have questions or already have a Serve card and have suggestions on how best to use it, we want to know. Leave your comments below. Advertiser Disclosure: The card offers that appear on this site are from companies from which Let’s Do Taxes receives compensation. This compensation may impact how and where products appear on this site (including, for example, the order in which they appear). Letsdotaxes.com does not include all card companies or all card offers available in the marketplace. * Terms, conditions and exclusions apply.